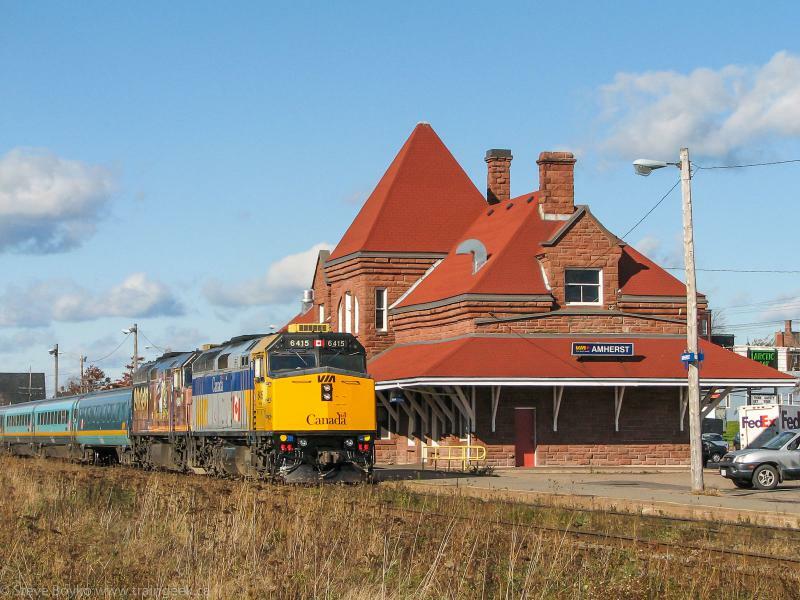 The historic train station in Amherst, Nova Scotia is in trouble. This station, opened in 1908, served CN and later VIA Rail trains for decades. The station closed in late October 2012 when VIA Rail cut the Ocean to three round trips/week and closed many of its stations. The Ocean still stops there but onboard staff handle baggage and the station is locked. The station was host to an artisan's gallery in 2013 but pipes burst in the station over the winter and caused quite a bit of flooding. Currently the station is empty and it is estimated that it could cost over $200,000 to repair the damage. The town is looking for input on what to do with the station. I believe VIA Rail still owns the station. It is protected under the federal Heritage Railway Stations Protections Act, meaning that it cannot be demolished or significantly altered. Unfortunately the Act does not require that the station be maintained in any way, something I learned during my time with the Fredericton Friends of the Railway in our work to preserve the Fredericton train station. This editorial makes good points about the station. The town has no municipal use for the station, and Amherst is full of heritage buildings looking for funding to preserve them. As a railfan of course I want the station preserved. Hopefully some organization can step forward and find a good use for this lovely building. PS Alan Graham has some photos of the lovely second floor of the station. Thanks, Alan, those are some great photos you have of the second floor of the station. I'll put a link to your Flickr gallery in the post, if you don't mind! What a shame. Those upstairs photos remind me a lot of the upstairs of the VIA station in New Carlisle (less ornate of course) Everything on the walls seems to be intact but the floor is covered in a layer of just about everything. I agree, Taylor. I was only in the ground floor of the New Carlisle station. I recall some photos I stumbled across of the Fredericton train station before it was restored and although it was a huge mess inside, you could see how it used to be a nice station with some great woodwork. Let's hope the Amherst (and New Carlisle) station doesn't reach that point.